Rachael Ray calls herself the Queen of Burgers and I have to say that she isn't lying. 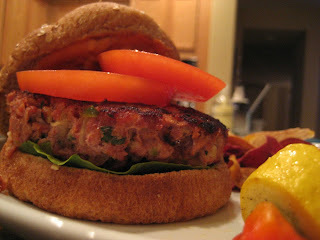 These Cajun Pork Burgers were, like all of Rachael's burger recipes that I have tried, outstanding. I'm usually skeptical of a burger recipe without cheese on it, but these burgers have so much flavor, you won't even miss that cheese at all. I promise. What really gives these burgers that extra something something is the special sauce. So, whatever you do, don't cut corners on the sauce! I served the burgers with some veggies that I drizzled with EVOO and some McCormick Montreal Steak Seasoning and roasted in the oven until they were nice and tender. Cut sausage into large chunks and place in a food processor. Grind sausage into crumbles. Combine ground sausage with pork, vegetables, garlic, thyme, hot sauce and a little salt and pepper. Form mixture into patties and cook 7 minutes on each side on an indoor electric grill preheated to high [I think she's specific about an indoor electric grill because the burgers probably don't stick together well enough to use an outdoor grill]. To cook in a skillet, heat a nonstick skillet over medium high heat and cook burgers 6 to 7 minutes on each side. For outdoor grill, cook patties 6-inches from hot coals or over medium high gas heat 6 minutes on each side, covered. Mix chili sauce, mayonnaise, and sweet relish in a small bowl. Serve burgers on crusty rolls with special sauce, lettuce, and tomato. Serve with red bean salad and Cajun oven fries. Oh, I have to make these. They look delish! These look great Madeline. I'll have try this one for certain!